Accepted Scientific Name: Echinocereus viridiflorus Engelm. in Wisliz. Mem. Tour N. Mexico [Wislizenus] 91. 1848 Wisliz., Wisliz., Wisliz. Echinocereus viridiflorus Engelm. in Wisliz. Echinocereus viridiflorus var. elongatus* hort. ex Backeb. Echinocereus viridiflorus var. intermedius Backeb. Cereus viridiflorus var. minor Engelm. Echinocereus viridiflorus var. montanus hort. Echinocereus viridiflorus var. chloranthus (Engelm.) Backeb. Echinocereus neocapillus (D.Weniger) W.Blum & Mich.Lange in W.Blum et al. Echinocereus viridiflorus subs. correllii (L.D.Benson) W.Blum & Mich.Lange in W.Blum et al. Echinocereus carmenensis W.Blum, Mich.Lange & E.Scherer in W.Blum et al. Cereus viridiflorus var. cylindricus Engelm. Cereus viridiflorus var. tubulosus J.M.Coult. Echinocereus chloranthus subs. cylindricus (Engelm.) W.Blum & Mich.Lange in W.Blum et al. Echinocereus chloranthus subs. rhyolithensis W.Blum & Mich.Lange in W.Blum et al. Echinocereus viridiflorus subs. davisii cv. brevispinus hort. Echinocereus davisii f. brevispinus hort. 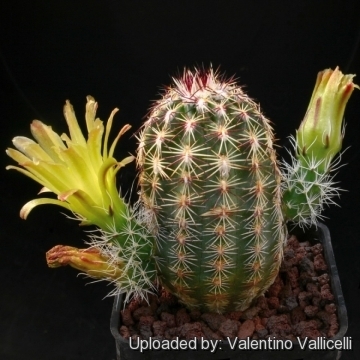 Description: It is a more robust form but not sufficiently differentiated and considered merely a local variant of Echinocereus viridiflorus var. viridiflorus. Echinocereus carmenensis W.Blum, Mich.Lange & E.Scherer in W.Blum et al. : has stocky body covered by tight yellowish pectinate spines and peculiar chocolate-scented flowers. Distribution: La Cuesta, passo Sierra del Carmem, Coahuila, Mexico. Echinocereus milleri W.Blum, Kuenzler & Oldach: has the "hairy" seedlings of Echinocereus viridiflorus var. 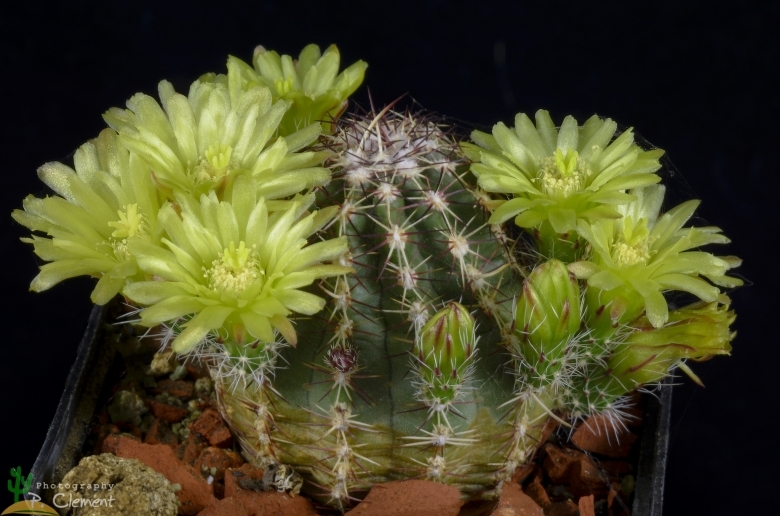 neocapillus, but has fewer spines it is also similar to the yellow spined Echinocereus viridiflorus subs. Correllii (which it obviously is not). Echinocereus russanthus D.Weniger: has spheric to cylindrical stems, 8-30 tall and 4-8 cm Ø; ribs 10-20. Spines: Interlocking, bristly, typically reddish to brown, radiating in all directions. Distribution: Chihuahua (Mexico) and N-W Texas (USA). Echinocereus russanthus f. cristata hort. : crested form. Echinocereus russanthus subs. fiehnii (Trocha) W.Blum & Mich.Lange: Distribution: endemic to the Sierra del Nido, central Chihuahua, Mexico. Echinocereus russanthus subs. weedinii Leuck ex W.Blum & Mich.Lange in W.Blum et al. Echinocereus viridiflorus Engelm. in Wisliz. : ssp. viridiflorus (Typical form) With small stems and relatively pure yellow flowers, extends from central New Mexico and the Texas Panhandle to South Dakota. Echinocereus viridiflorus var. canus A.M.Powell & Weedin: has hairy juvenile forms. Distribution: Solitario, Sandstone ridge above Righthand Shutup, Presidio Co., Texas, USA. Echinocereus viridiflorus subs. chloranthus (Engelm.) N.P.Taylor: has 10-18 ribs, 5 or more central spines, giving the plants a bristly appearance, it is often considered a separate species (Echinocereus chloranthus). Distribution: W. Texas, S.E. New Mexico, and N. Mexico. Echinocereus viridiflorus subs. correllii (L.D.Benson) W.Blum & Mich.Lange in W.Blum et al. : It is a poorly defined, yellow-spined population near Marathon, Texas. Echinocereus viridiflorus cowperii n.n. : same as: Echinocereus viridiflorus var. rhyolithensis. Echinocereus viridiflorus subs. cylindricus (Engelm.) N.P.Taylor: The common morphotype grows at middle altitudes in Texas and southeastern New Mexico, it has 0-2(-3) central spines. Echinocereus viridiflorus subs. davisii (Houghton) N.P.Taylor: In the broad sense Echinocereus viridiflorus may prove paraphyletic with respect to Echinocereus davisii, but they are phenologically isolated, with Echinocereus davisii flowering earlier and thus appearing reproductively isolated in the wild. Echinocereus viridiflorus subs. davisii cv. brevispinus hort. : has very short spines, usually radial, pectinated, stout, fang like, white whit a dark contrasting tip 2-4 mm long. Spine clusters looks like small starfishes. Echinocereus viridiflorus var. neocapillus (D.Weniger) A.D.Zimmerman: Remarkable for its softly hairy, not sharply spiny, seedlings. Echinocereus viridiflorus var. rhyolithensis W. Blume & Mich.Lange: (Echinocereus russantus forma) Bristly red-spined plants from New Mexico. Echinocereus viridiflorus var. robustior Kuenzler: It is a more robust form but not sufficiently differentiated and considered merely a local variant of Echinocereus viridiflorus var viridiflorus. Distribution New Mexico. 2) John Pilbeam (1999) “Mammillaria The Cactus File Handbook” Nuffield Press. Cultivation and Propagation: This cactus is widely cultivated for its flowers, in culture E. viridiflorus is without problems and regularly shows its small green flowers if we provide an adequate winter rest period. It is sensitive to overwatering (rot prone) needs good drainage, Keep drier and cool in winter. Need full sun; Very cold resistant hardy to -20° C or less for short periods of time.